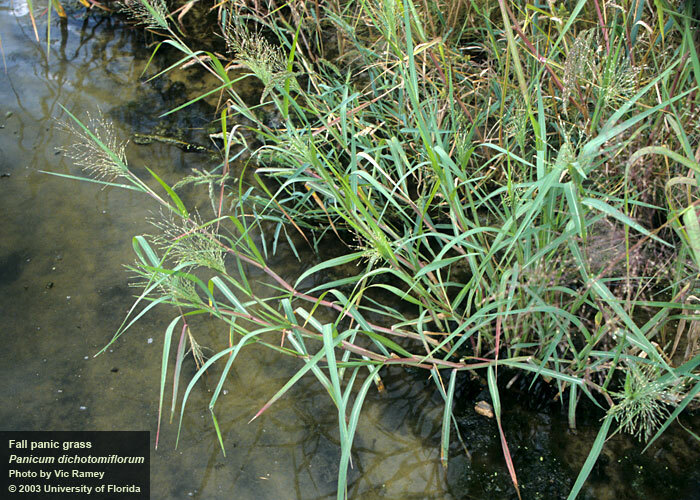 Panicum dichotomiflorum.Vic Ramey.University of Florida.Center for Aquatic and Invasive Plants.plants.ifas.ufl.edu (Accessed 5/2014). Panicum dichotomiflorum is an annual, tufted, C4 grass (Downton 1971), to 1 m (usually smaller), often very stout and coarse, partly reddish, base of stem to 1 cm wide, lower nodes swollen, stems usually reclining or bent near base, compressed, often zigzagging from node to node, branched from base and nodes, hairless. Leaves large, 2-50 cm long, 0.3-2.5 cm wide. 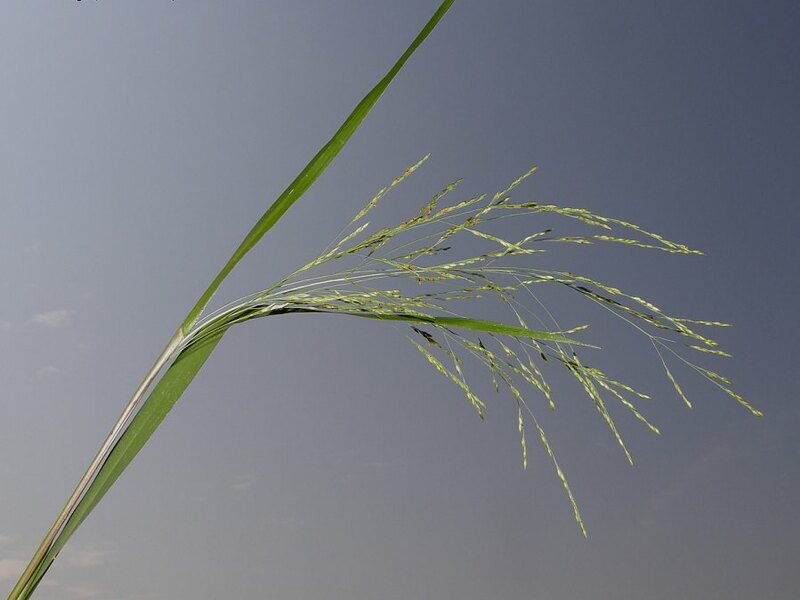 Panicum dichotomiflorum.Enrico Romani.Forum Acta Plantarum.actaplantarum.org (Accessed 1/2017). Flower spikelets 1-flowered, small, 0.2-0.3 cm long, less than 0.1 cm wide, elliptic to oblong, green to purple-tinged, stalked, 1st glume about 1/3 length of 2nd; inflorescence to 40 cm long, widely branched but slow to emerge from surrounding leaf sheath; blooming and fruiting June-Oct., usually late season, found blooming Sept. Frequency in NYC: Occasional (more common than indicated by collections). Habitat: Moist to wet, open areas, roadsides, curbs, disturbed soil pH 4.8-7 tolerant of infertile, wet, anaerobic soil, moderately tolerant of salt, intolerant of drought, fire, shade (USDA, NRCS 2010). Notes: Seeds of Panicum sp. eaten by many birds, foliage eaten by Muskrats and rabbits.